A trip to London’s Brick Lane would not be complete without a visit to one of the two iconic bagel shops. Brick Lane is now more renowned for its curry houses so the two bagel shops hark back to older times. The Beigel Shop, the one with the yellow shop front, was established in 1855 when the area was home to a large Jewish community. The community dispersed to North London, the synagogue is now a mosque but the Beigel Shop remains and has become an institution. The other shop, Beigel Bake, has the white shop front. Both bagel* shops are open 24 hours a day, seven days a week and are popular with tourists, cabbies, night clubbers and post night clubbers. They both serve a range of traditional fillings for bagels, bread rolls and chola (challah) such as chopped herring, smoked salmon and hot salt beef as well as other fillings such as egg and tuna. They also sell a range of cakes and pastries. 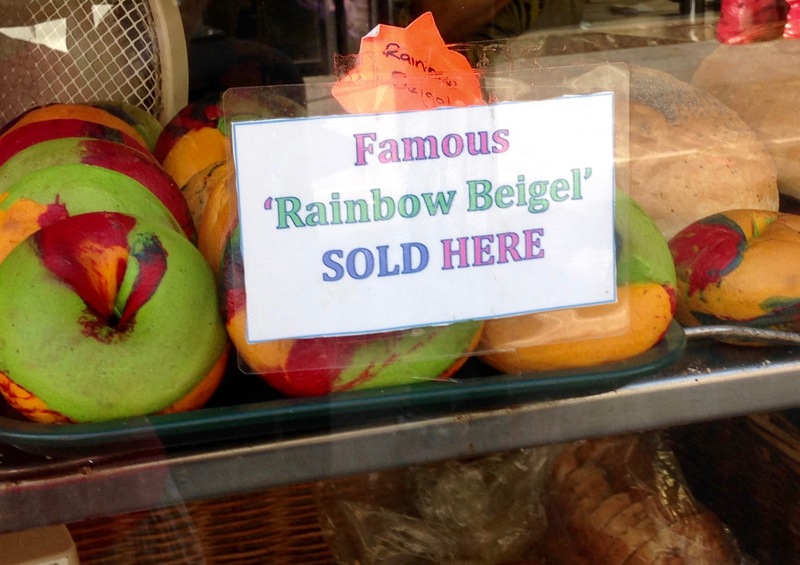 The Beigel Shop, however, can lay claim to introducing the rainbow bagel to London in early 2016. You will see a tray of them on display in the window. So what of the other bagels? The bagels are made to a traditional, family recipe and are slightly chewy with a slightly crispy crust. My favourite filling is smoked salmon and cream cheese. At the Beigel Shop, these bagels are filled with a few slices of smoked salmon and a nice schmear of cream cheese. This will cost you less than £2 (a time of writing) – a huge bargain! 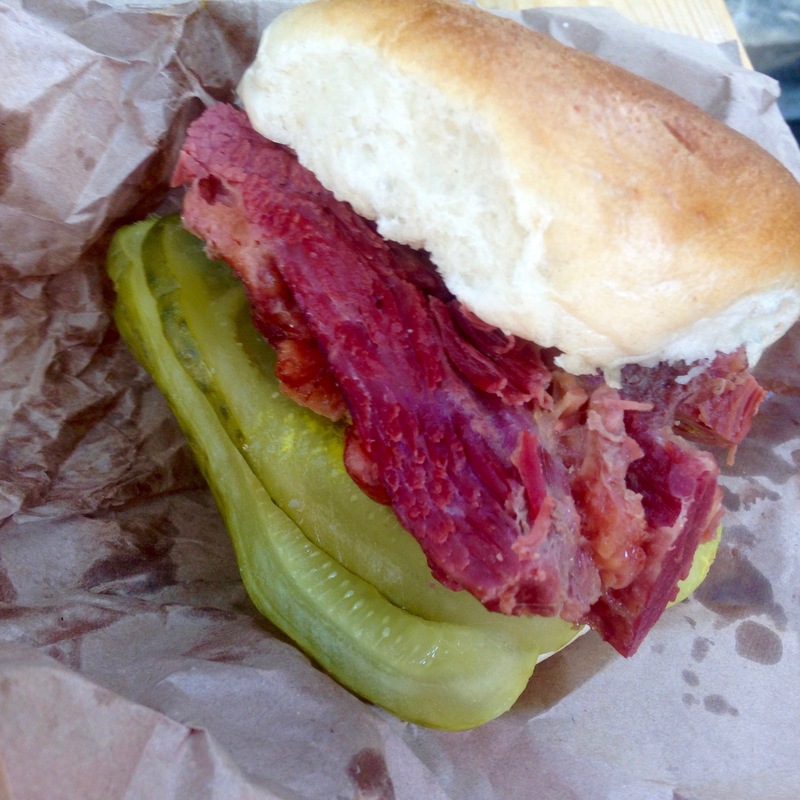 The legendary salt beef bagel is filled with a generous amount of warm home made salt beef, sliced gherkins and mustard – messy to eat but very reasonably priced at around £4. Other fillings include prawn, ham and bacon – these will set you back no more than £3. There are usually queues outside the Beigel Shop but these do move quite quickly and you won’t wait long. 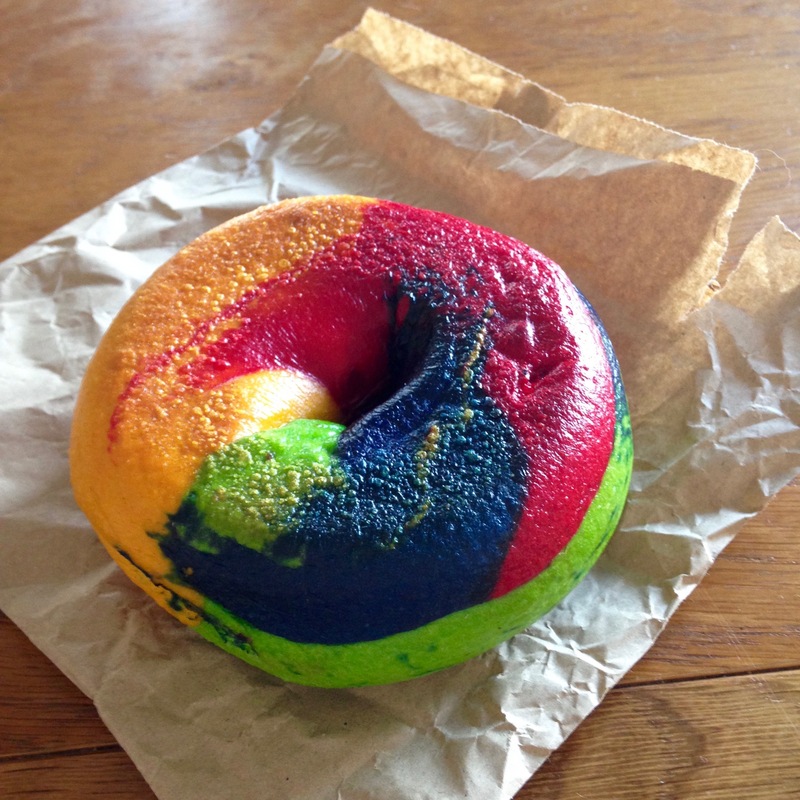 The only downside is that you may struggle to find somewhere to eat your delicious bagel as there aren’t any seats or many park benches nearby. For an authentic and cheap bagel (or beigel), you can’t go wrong!